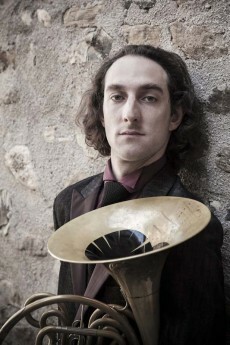 Principal horn of the Orchestra of the Accademia Nazionale di Santa Cecilia, Guglielmo Pellarin began to play horn at age seven, graduating with highest honors from Conservatorio J. Tomadini of Udine. He has performed with the Orchestra of Teatro Verdi, Orchestra of Teatro alla Scala, Orchestra Filarmonica della Scala, and Orchestra Filarmonica Toscanini. Mr. Pellarin’s solo and chamber music career includes trio performances with pianist Federico Lovato and violinist Francesco Lovato. They perform special arrangements by D. Zanettovich and F. Francescato of Brahms’s Serenade, op. 11, and Strauss’s Till Eulenspiegel. With Federico Lovato he recorded French Music for Horn and Piano for Audite. He gave the world premiere of F. Perez Tedesco’s Concerto for horn and strings, which Tedesco dedicated to him. He also plays in the Quintetto di Fiati Italiano with lead players of the Accademia Nazionale di Santa Cecilia and of the Royal Concertgebouw Orchestra. Mr. Pellarin is the horn teacher of the I Fiati master classes at the Accademia Nazionale di Santa Cecilia and at Conservatorio C. Pollini of Padua. He graduated in mathematics from Padua University and attends a master’s degree program at La Sapienza in Rome.